Tokyo Dome City’s new multi-functional complex, LaQua, was the first stop on our city walk list this year. The new complex, with spa facilities, restaurants, shops, and amusement attractions, opened in May of 2003. 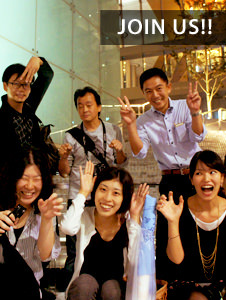 The theme was to build an oasis in the middle of Tokyo, somewhere to relax, refresh, and have fun. 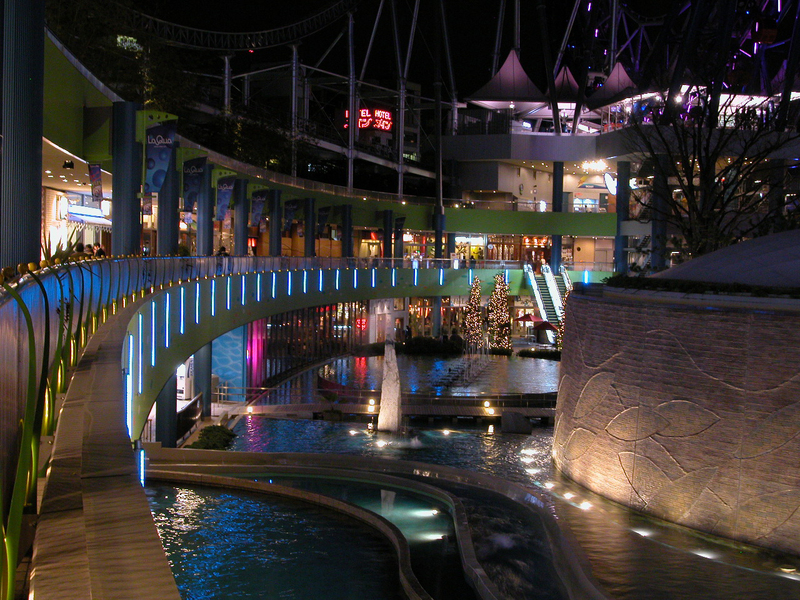 And the first impression of LaQua reflects just that, as the spectacular color from the amusement park catch your eye. 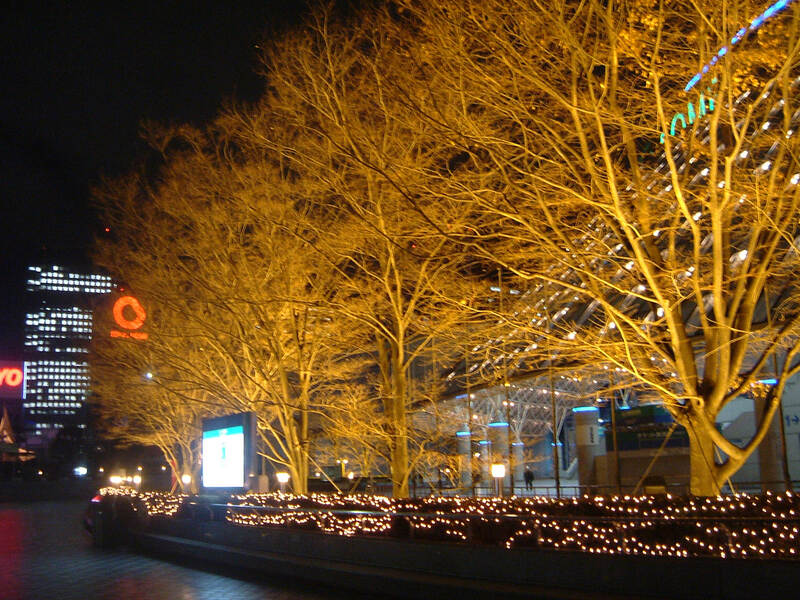 Trees lining the paths are bathed in a gold light, show their bare winter limbs, and small shrubs and bushes are also covered in twinkle lights. It seems everywhere you look light is incorporated into something, creating a vibrant light environment. The lux level reading from our illuminance meter doesn’t even begin to reflect the effect the lighting has on the feeling of brightness in the park. 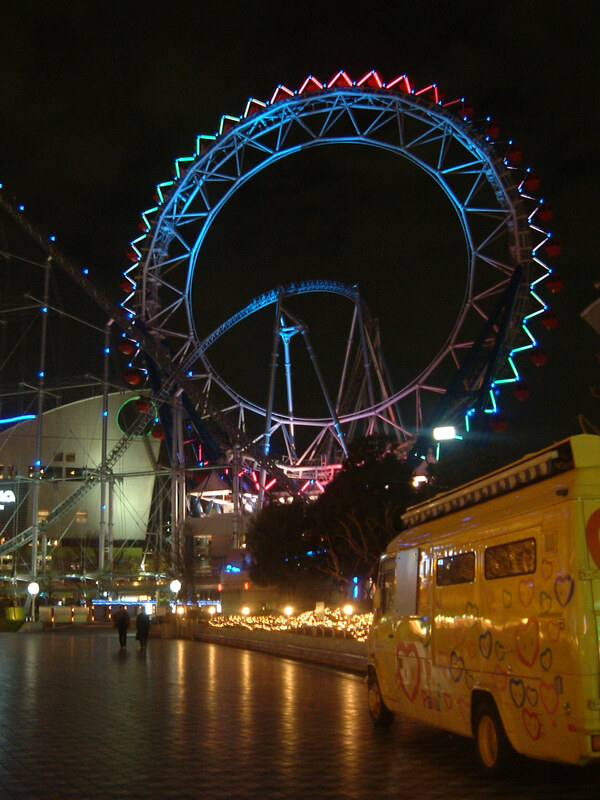 Another feature of the park is the world’s first ever center-less ferris wheel, Big O. A roller coaster, also, jets through the middle, unceremoniously illuminated, it only adds to the powerful impression of the gigantic “ring.” The colorful and kinetic lighting on the outer portion of the ring consist of many LED units. Each unit is further broken down into 4 parts to be programmed for a more detailed assortment of lighting display. The ring, the coaster, and the Water Symphony, a water, light, and sound show, in the plaza, turns the nightscape into an, alive, 3-dimensional canvas. LaQua lighting environment is full of color, movement, invitation, and eye stopping light, just as exciting as a trip to Disneyland, and by just glancing around the park, one can tell that the emphasis is placed on entertainment, rather than functional lighting. One has to ask, does this fulfill the original concept? Sometimes projects cannot be looked at from only a scientific angle, but require more conceptual techniques for analyzing. Questioning if lighting can be molded into representing certain ideas or what the light is supposed to represent are good places to start when surveying LaQua. Next, the group headed to nearby Bunkyo Ward Shopping Center Observation Deck. With only 25-stories, the center gave us a lower perspective than most viewing galleries of the Tokyo nightscape. From this height we also got a chance to view LaQua from above. No matter how complex, things seem to look simple and beautiful from a distance. This observation deck is a wonderful hide-away in the middle of Tokyo; no crowds, 330°view, and no reflections in the window, as care was obviously taking in planning the lighting environment for the observation room.